by C.W.Scott-Giles, O.B.E, Fitzalan Pursuivant Extraordinary Coat of Arms No.42, Winter 1960. By a warrant dated at Oxford May 6th 1645, King Charles I empowered Sir Edward Walker, Garter King of Arms, “for the Incouragement and reward of such as valiantly and faithfully adhered to him during the unnatural Rebellion”, to grant such persons “by way of Augmentacion, out of his Royall Badges, such additions unto their Armes as might aptly testify the nature of their worth and meritts”, and also to grant appropriate arms to those who had none. This was recited in a further warrant issued to Sir Edward Walker by King Charles II on September 3rd 1660, in which it was stated that “the King had considered the necessity that such Additions should (in this tyme of generall reward) be afforded to such persons of exemplary meritt as shall desire the same; as also to avoyd the trouble and importunity of passing such under our Great Seale”. The King therefore gave Garter “full power and authority to give, grant and assigne, unto any person of eminent quality, fidelity, and extraordinary meritt, that shall desire it, such Augmentacion of any of our Royall Badges to be added unto his Armes, as you shall iudge most proper to testify the same; And if any person of fidelity and desert cannot prove himself a Gentleman of Coat Armour, that in such case you may, and shall grant and assigne him such Armes and Creast as hee may properly beare for his honor, and as you in your discrecion shall iudge fitt and convenient”. In conformity with the terms of the warrants, most of Sir Edward Walker’s augmentations consisted of Royal Badges, those most frequently granted being the rose, the portcullis, and the lion of England. However, in some cases he seems to have interpreted his authority somewhat liberally, so as to grant as additions to arms, or as charges in coats and crests of augmentation, the Royal Crown, the Sceptre, and the Orb. The grants under these warrants fall into three groups, viz. those made in 1645-6 before King Charles I surrendered to the Scottish Army; those made during King Charles II’s exile; and those made after his Restoration. Under King Charles I’s warrant there were about a dozen grants of augmentations in the years 1645-6. Most of these consisted of a canton charged with a rose or a lion of England. Among the recipients of a canton gold charged with a rose gules were Sir Bernard de Gomme, a Dutchman, Engineer and Quartermaster General in the Royalist Army; Sir Bartholomew de Crequi, Lord de la Roche, a Frenchman, “Captain of the Fire Workes”; and Humphry Painter, Sergeant Chirurgeon. A canton or with a rose gules charged with another argent was granted to Captain John Aylett and to Captain Henry Yonger, Comptroller General of the Train of Artillery; while in the case of a similar augmentation to Patrick Ruthven, Earl of Brainford (Brentford) and Forth, the rose was placed within the tressure of Scotland. A canton gules charged with a lion of England was granted to Colonel Sir Richard Page, and to Sir John Walpoole, Cornet of the King’s Troop, and a fess gules similarly charged was awarded to Abraham Walker of the Hague, Jeweller to the Princess Royal. After the death of King Charles I, Sir Edward Walker continued to grant augmentations on the authority of King Charles II, whom he followed and faithfully served during the years of exile. The places where these grants were made were Jersey in 1649, the Hague 1649-50, and Brussels in 1658. Grants made at Jersey in 1649 included a coat of augmentation to Sir Edward Walker himself, who was described, in addition to Garter King of Arms, as “Clerk of the Council and Receiver General of his Maties. Money”. The coat was Argent on the cross of St. George gules five leopards’ faces or. In the same year and place two grants were made incorporating the Royal Crown. 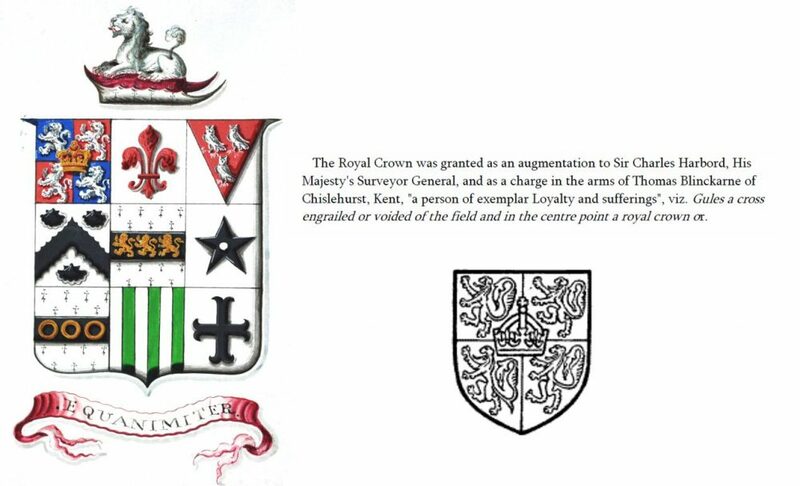 Dr. Richard Steward, Dean of His Majesty’s Chapel, received the Crown on an escutcheon gules as an augmentation to his arms; and Sir Edward Nicholas, Principal Secretary of State, was granted as a coat of augmentation, Argent on the cross of St. George gules a royal crown or. This coat is used, apparently without authority, by the Society of Antiquaries. At the Hague in 1649 Sir Charles Lloyd, who was Quartermaster General of the King’s Army in 1644, and his brother Sir Godfrey, a military engineer, were granted a lion of England in fess as an augmentation to their ancestral arms, Sable three horses’ heads erased argent.Other augmentations granted in 1649-50 included a canton gules charged with a leopard’s face or to Richard Pyle, Sergeant Chirurgeon to the King, and a chief gules charged with a lion of England to Sir Theodore Graswincle of Delft. Captain John London, “who principally induced the Navy in the Downes to return to their Obedience anno 1649”, was granted at Brussels in 1658 as arms, Azure semé of anchors a naval crown or, and as crest a sea-lion azure supporting a golden anchor. The well-known grant to Colonel William Careless was also made in 1658 at Brussels. He hid with the king in the “royal oak” following the battle of Worcester. The arms and crest assigned to Carlos are described as follows: Or an oak tree proper, over all a fess gules charged with three imperial crowns of England. The crest a word crossed with a scepter within a civic crown. As well as granting these arms the King directed that the surname of Careless should be rendered as Carlos, the Spanish version of Charles. Augmentations granted after the Restoration of 1660. During the ten years following the Restoration of King Charles II, Sir Edward Walker granted a number of augmentations on the authority of the warrant of September 3rd 1660. Most of these consisted of a canton or escutcheon charged with one of the Royal Badges or a lion of England. Among those who received a canton charged with a rose were Dr. Bryan Duppa, Bishop of Winchester, the King’s former tutor, and Dr. Sheldon, the King’s Chaplain, who became Archbishop of Canterbury, and as Chancellor of Oxford built the Sheldonian Theatre. A rose on an escutcheon was granted to Noah Bridges, who had been Clerk of the Parliament at Oxford. The rose was crowned in the augmentation given to John Sayer, His Majesty’s Master Cook. A canton charged with a crowned harp was granted to Sir George Lane, one of the Clerks of the Privy Council and Secretary to the Marquess of Ormonde, Lord Steward of the Household; with a portcullis to John Brydall, Secretary to the Master of the Rolls; with a fleur-de-lis to Sir Edmund Pierce, Doctor of Law; and with a crowned lion of England to Sir Philip Meadowe. A lion of England on an escutcheon was granted to Francis Wolfe of Madeley, Salop, “by his Maties. special Warrant and Command, for enterteyning his Matie. after the Battell at Worcester”. Sir Samuel Morland, a diplomatist who had promoted the Restoration, was also granted a lion of England to be borne in the dexter chief of his arms. A coat of augmentation commemorating the return of the Tower of London to the King’s custody was granted to Sir John Robinson Bt., Lord Mayor of London 1662-3 and first Lieutenant of the Tower after the Restoration. This was, Quarterly embattled gules and or, in the first quarter a tower argent and on the battlements thereof a lion statant gardant gold. (The tower was probably tinctured argent as a reference to the White Tower.) This coat was quartered with his paternal arms, Vert semé of trefoils a buck trippant or. 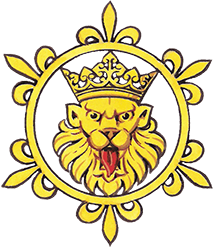 Sir Henry Bennet, a principal Secretary of State, later Earl of Arlington, received as an augmentation the Royal Orb, which was borne in the centre of his paternal arms, Gules three demi-lions rampant argent. The grant to Sir Robert Holmes in 1668 sets out in some detail his services as a naval commander and mentions in particular that in 1666, as Rear Admiral of the Red Squadron, he entered the harbour of Vlie in Holland where he burnt 180 Dutch ships, and landed on the Island of Schelling with 1,200 men and fired its chief town. To be quartered with his paternal arms, Or three weasels sable, was granted as a coat of augmentation, Barry wavy of six or and azure, on a canton gules a lion of England gold. With this was granted a crest, out of a naval crown or an armed arm holding a trident azure headed gold (cf. the crest of the Royal Fishing of Great Britain and Ireland, granted by Walker in 1664. “Ye Great and Signal Service performed to Us by John Lane of Bentley in com. Stafford Esqr. deceased, in his ready concurring to ye Preservation of Our Royal Person after the Battel of Worcester at which time contemning the threatnings published by the Murtherers of Our Royal Father, against any who should conceal or assist Us, and disclaiming the Rewards proposed to such as should be instrumental in the discovery and destruction of Our Person, and not valuing any hazard his Family might run with the duty of an unspotted Allegiance, did by his great prudence and Fidelity conduct Us, as that we were able at length to retire to places of safety beyond the Seas. In 1678 John Lane’s son, Thomas, was granted by Sir William Dugdale, Garter, a crest of augmentation: “Out of a Wreath or and azure, a demy-horse strawberrie colour, bridled sable, bitted and garnished or, supporting an imperiall crown gold”. Thomas Whitgreave of Moseley Hall, where the King found shelter for two nights before he reached Bentley, received no heraldic recognition in his lifetime, but a commemorative augmentation was granted to his great-great-grandson. 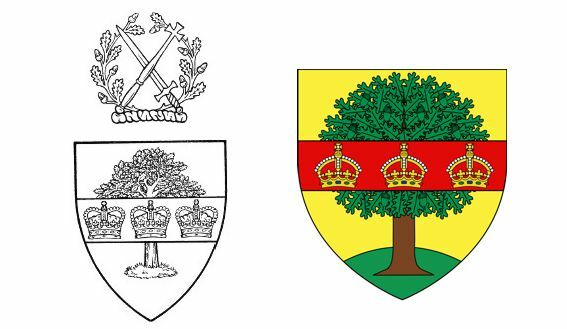 This consisted of a chief argent and thereon a rose gules irradiated gold within a wreath of oak proper; together with a crest: out of a ducal coronet a sceptre in pale or surmounted by a branch of oak proper and a rose gules slipped in saltire also proper. Reviewing the recipients of these augmentations, together with others there is not the space to deal with, one finds that, loyal and worthy men though they were, few of them were of great eminence. It will, perhaps, put the augmentations granted during this period into perspective if we reflect that in similar circumstances today many of these men, instead of receiving an heraldic distinction, would be appointed to the third, fourth or fifth class of one of the Orders of Chivalry. I should like to acknowledge with gratitude the assistance afforded me by Mr. A. C. Cole, Portcullis Pursuivant, and Mr. J. P. Brooke-Little, Bluemantle Pursuivant, in making available to me certain books in the College of Arms.